For many inventors, it’s magical when an idea becomes a number. For Dallas entrepreneur Peter Bastawros, the number was 9138638. And the idea? Bring technology to the very traditional game of golf. The product is called Game Cart Golf, and it uses video and other technology so players to compete with friends who may not even be on the green. “Folks can be following along either in other carts, back in the clubhouse, in a kiosk or online,” Bastawros says. This idea, though, almost never became 9138638. When Bastawros’ attorney sent the paperwork to the patent office, they waited 21 months for a response. 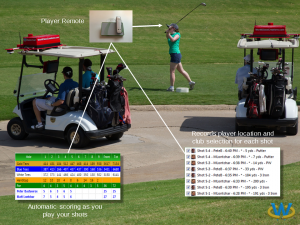 Game Cart, created by Peter Bastawros, provides automatic score chart and scoring updates. That response was a full rejection. “I had to brace myself there and not allow it to become a deterrent,” Bastawros says. He would spend an additional several thousand dollars before finally getting his idea patented. There are lots of obstacles in the patenting process – money, time, knowledge. Every year, the U.S. Patent and Trademark Office receives hundreds of thousands of applications. There’s a backlog of more than 600,000 ideas that need to be sifted through. Agency head Michelle Lee, formerly with Google, wants to simplify and speed up the process. As part of the efforts, the agency – which has a team of more than 8,000 patent examiners – is opening regional offices in four cities across the United States: Denver, Detroit, San Jose and Dallas. Dallas is the final satellite office to open to the public. Lee says Dallas was chosen because of its central location, the high number of patent applications in the region, the low cost of living, and vast technical resources. “There’s a lot of incubator startup activity in the Dallas, Fort Worth, Austin area and we hope to service that,” Lee says. The hallways are decorated with giant diagrams of Texas inventions – animal shears, an acetylene gas apparatus, a vacuum fuel additive inductor – remember, most people aren’t coming here for the artwork. The real attractions are the private meeting rooms, training space and an exclusive public search facility. 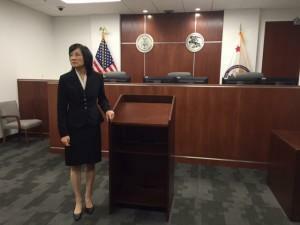 Michelle K. Lee, director of the U.S. Patent and Trademark Office, in the new Dallas location. “So if they invent something and they wonder ‘I wonder if anyone has done anything like this before’ they have access to exactly what our examiners have access to and they can check that,” Lee says. This office will employ 80 patent examiners – and for the first time applicants in Texas won’t have to travel to other states to meet with examiners and discuss their inventions. “If you’re an applicant, the ability to sit down and look your patent examiner in the eye, to point to diagrams, to explain your invention, makes a huge difference in terms of customer satisfaction but also the quality and the speed with which you get the patent,” Lee says. Bastawros, the entrepreneur, says the new satellite office would have made his patent research much smoother. “Just having interface with the office is an important element for innovators,” he says. The patent office in Dallas will serve the entire Southwest. Trey Bowles, the cofounder and CEO of the Dallas Entrepreneur Center, has been working to help connect the U.S. Patent and Trademark Office to startups across Texas. He says this office will be an invaluable resource for the small business owners. The Dallas Entrepreneur Center has created a phone booth for direct access to assistance at the U.S. Patent and Trademark Office. “It’s daunting when you start a business, it’s daunting when you have an idea,” he says. 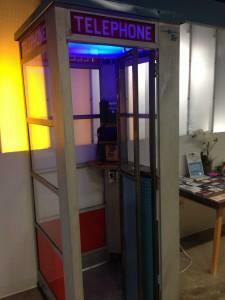 The Entrepreneur Center also launched a special phone booth that directly connects with assistants at the U.S. Patent and Trademark Office. California Whooping Cough Outbreak Linked To Unvaccinated: Texas, Too? Texas reports more than 2,300 cases of whooping cough so far this year, the highest in 50 years. A new report on California’s 2010 whooping cough outbreak links clusters of unvaccinated people with areas that had the highest number of whooping cough cases. Speaking to an audience in New Jersey yesterday, Texas Gov. Rick Perry called the opening of the Obamacare health insurance marketplaces a “felony” against young people.